A widened road costing £55m and designed to relieve congestion on one of the busiest commuter routes in Cambridgeshire has been opened. The A428 between Caxton Common and Hardwick was widened to become a dual carriageway in the scheme which began in Autumn 2005. 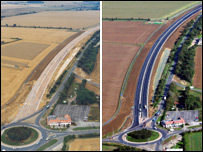 The road, which carries some 20,000 vehicles a day, links the M11, A1, A14. Roads Minister Dr Stephen Ladyman said the widening aimed to provide a "safer route with fewer traffic collisions". Mr Ladyman added: "Other benefits include reduced noise from traffic, improved air quality and safer access on and off the A428." The dual carriageway was officially opened on Thursday, three months ahead of the Highways Agency's schedule. A tree planting scheme is to continue with 130,000 trees and shrubs planted to improve local ecology, the Highways Agency said.